While many other retailers will try to sell you INSURANCE or to spend money on another copy of the same game. 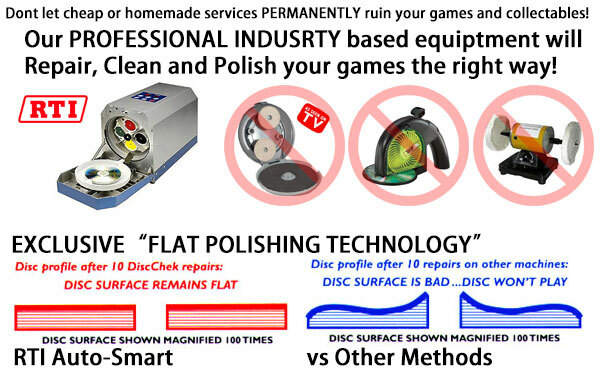 Our store has PROFESSIONAL equipment to REPAIR your discs with out wasting your money. Our machines are not just a buffer, they are full service machines... to both clean and repair your valuable discs! Fast - cleans in less than 1 minute... repairs most discs in 3 minutes or less. The liquid-cooled process safely removes even deep scratches without harming the disc. No heat! Discs are perfectly restored, clean and dry right out of the machine. Save time! Save money! No hand finishing or wiping discs required. Patented micro-abrasive pads provide the highest quality finish...no other process comes even close!